We just had a wonderful weekend with my younger sister Connie and her boyfriend Olli and the three kids. I haven't uploaded the photos yet (approx 560) so I'm loading photos from the past two weeks. Sorry for the delay in updating the blog - it mostly has to do with the FANTASTIC new camera that Mike and my in-laws got me for Christmas - now that I have a working camera I've managed to take over 1,500 photos in the past three weeks! Going through them has proven to be a chore! The other challenge is that I'm back at school and have had to get caught up on the marking - in the past week I've marked 25 fractions tests, 25 geography assignments, 25 health assignments, 25 french assignments and am 'currently' marking 25 English essays that are designed to 'support or condemn 24601's (Jean Valjean from Les Miserables) actions. Valjean was sentenced to four years in jail for stealing a loaf of bread. It's rather quite incredible what my students deem acceptable and unacceptable behaviour ~ and more importantly, why. But enough about work, onto the photos! 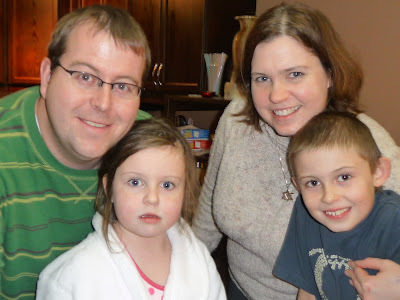 Cribbs family celebrating Rebecca's 6th (!) Birthday! 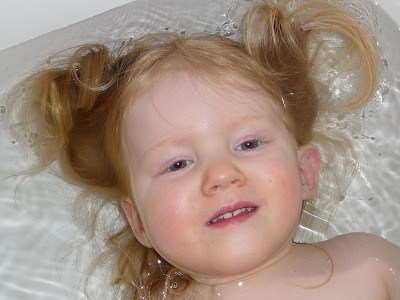 Lily LOVES bathtime. She has discovered our Irish Spring soap and wants to use it. It's a riot! We went skating at the outdoor rink in Victoria Park with a friend from work and his family. 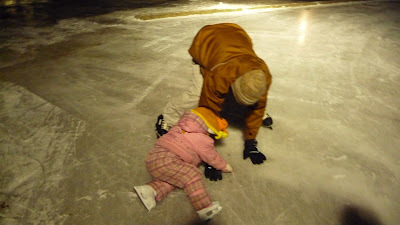 Here is a picture of Mike showing Lily how to get herself back up after she's fallen. 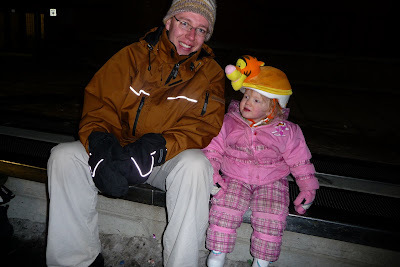 This was her first time on skates - she was awesome! Mike and Lily sitting on the bench waiting for the 'Zimpony' to do its work. 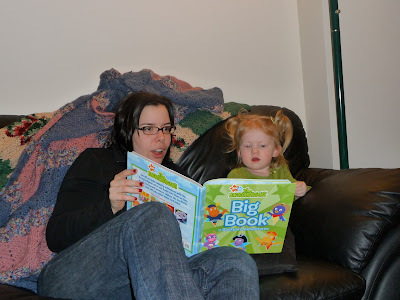 Lily was treated to a story by my friend Alicia who took the time to visit us on her recent visit home to Canada. Alicia is currently teaching music in Sweden. 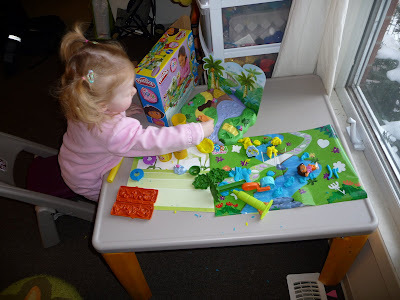 Lily is a mastermind when it comes to Play-doh! 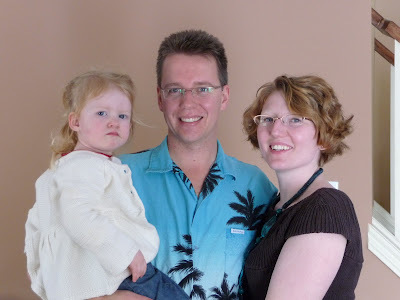 Szala family on January 1st, 2009! Lily didn't like being taken away from playing with her cousins Kyle & Rebecca. 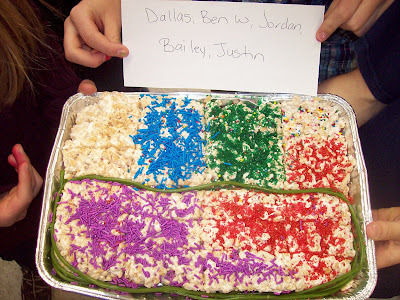 To help make learning fractions more palatable, I made 5 trays of Rice Krispie Squares for my students. They worked in groups of 5 and had to decorate the tray of RK according to my directions. Any guesses what the directions were? Lily loves her trains. 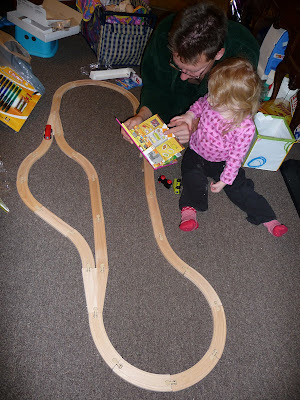 This is her and her Daddy after they set up the train set that Lily got as a Christmas gift from her Grandmama. Is Connie dating a Finn? Olli is definitely a Finnish guy's name... That would be cool.